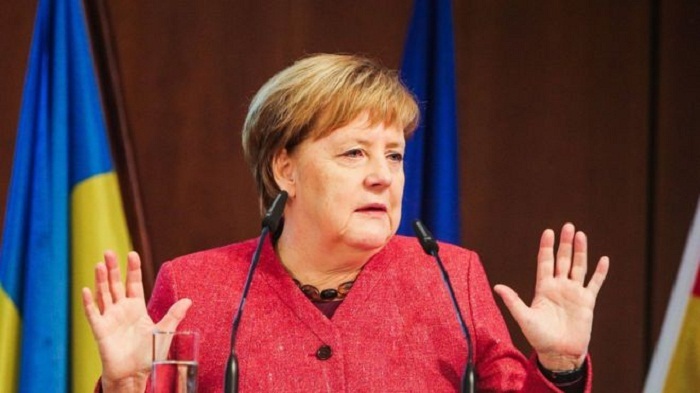 German Chancellor Angela Merkel has stressed there is "no military solution" to the naval confrontation between Ukraine and Russia off Crimea. On Sunday Russia fired on three Ukrainian ships sailing towards the strait between the Black Sea and the Sea of Azov, and seized their crews. Merkel blamed Russia for the crisis, but said it could only be resolved through "sensible dialogue". She was speaking alongside Ukrainian Prime Minister Volodymyr Groysman at a business forum in Berlin. Russian President Vladimir Putin accused Poroshenko of creating the naval "provocation" to boost his ratings ahead of 2019 elections. President Poroshenko has implemented martial law across Ukraine's border regions for 30 days in response to the crisis. The North Atlantic Treaty Organization is the world's most powerful regional defence alliance, and members agree that an armed attack against one is considered an attack against them all. Poroshenko told Germany's Bild newspaper: "Germany is one of our closest allies and we hope that states within Nato are now ready to relocate naval ships to the Sea of Azov in order to assist Ukraine and provide security." A Nato spokeswoman would not comment directly on Poroshenko's request, but stressed that "since Russia's illegal annexation of Crimea in 2014, Nato has substantially increased its presence in the Black Sea". In strict legal terms, Russia and Ukraine share access to its waters under a 2003 treaty. This though specifically states that warships from third countries can only enter the Sea or make port visits there with the express permission of the other party. Russia is hardly likely to give such permission. In practical terms it could easily block the Kerch Strait as it did earlier this week by placing a merchant vessel across the channel. It's more likely that Nato might seek to boost its naval deployments to the Black Sea where its members - Bulgaria, Romania and Turkey - are uneasy about Russia's more assertive behaviour. Indeed the alliance says that its vessels have already spent some 120 days on patrol or exercises in the Black Sea this year, compared with 80 in 2017. The chancellor promised to hold talks with Putin at the forthcoming G20 summit. "I want the Ukrainian soldiers released," she said. "We must do everything to help places like Mariupol, which depends upon access to the sea. "We can't allow this city to just be cut off, thus indirectly isolating further parts of Ukraine. "The Ukrainian side has asked us to act wisely. There is no military solution to these problems - we have to emphasise that." The peninsula was annexed by Russia in 2014, but officially remains part of Ukraine. Putin called the sea clash "a provocation" organised by Ukraine's authorities "in the run-up to the Ukrainian presidential election in March 2019". Poroshenko has low popularity ratings. Recent polls suggest that only about 10% of the electorate plans to vote for him next year, with nearly 50% saying they would not vote for him under any circumstances, the Kyiv Post newspaper reported. Putin added that the Ukrainian president's decision to impose martial law after a mere "border incident" was extreme, because martial law was not even imposed at the height of the conflict with pro-Russian separatists in eastern Ukraine in 2014. Putin insisted that Russia's military response was appropriate as the Ukrainians had "trespassed" into Russia's territorial waters. However, Ukrainian officials published a map on Wednesday, placing all three Ukrainian boats just outside Crimea's territorial waters at the time they were seized.